Swimming pool – adult 6.00. Swimming pool – child 3.00. 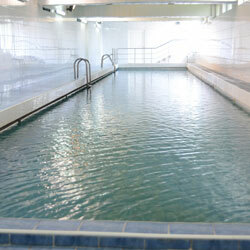 Thalassotherapy 1. Diseases of the musculoskeletal system – osteoarthritis, arthritis, post traumatic conditions, tendovaginitis, myositis, myalgia, etc. 2. Diseases of the peripheral nervous system – radiculitis, plexitis, polyneuropathy, etc. 5 190 10 360 The program includes: 2 medical examinations and 3 procedures daily as follows: pearl mineral bath with seaweed, lye, salts; underwater shower massage; manual partial massage; mud application, compress with lye. Antirheumatic 1. Diseases of the musculoskeletal system – osteoarthritis, arthritis, post traumatic conditions, tendovaginitis, myositis, myalgia, etc. 2. Initial stage of hypertension 5 160 10 290 The program includes: 2 medical examinations and 2 procedures daily as follows – manual partial massage with essential oils, pearl bath with essential oils, underwater shower massage, healing herbal tea . Antiasthmatic Respiratory diseases – chronic bronchitis, bronchial asthma, etc. 5 166 10 300 The program includes: 2 medical examinations and 3 procedures daily as follows – inhalations with lye, salts, herbs; electrotherapy , manual partial massage, breathing exercises, herbal tea.